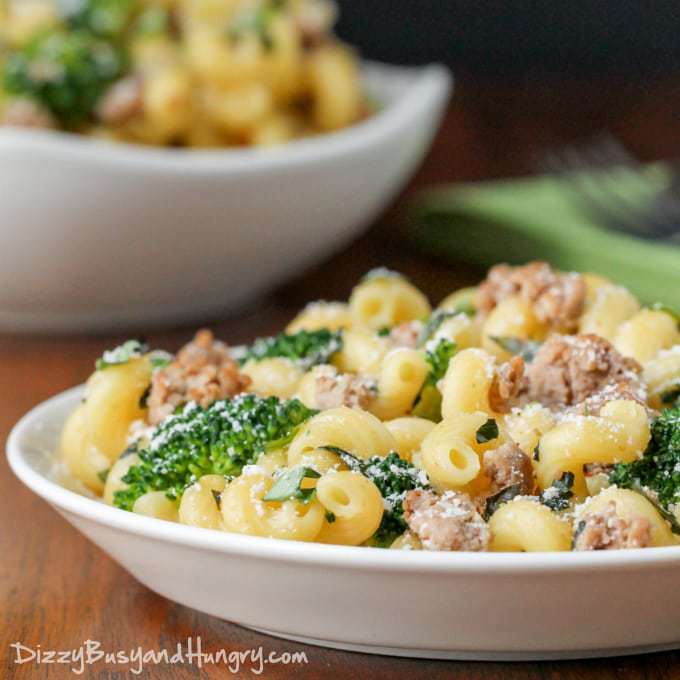 Easy Turkey Broccoli Pasta Dinner | Dizzy Busy and Hungry! 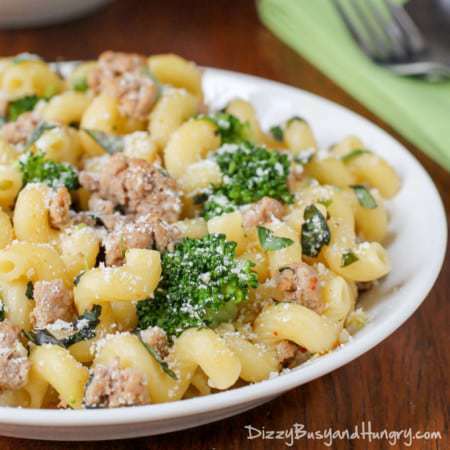 Easy Turkey Broccoli Pasta Dinner – Super-easy, family-pleasing dinner ready in less than 30 minutes! If you are looking for healthy ground turkey recipes, this one is definitely a perfect family meal. Use light pasta in it to keep it lean. Here’s an entree that is a guaranteed family-pleaser in my house! This Turkey Broccoli Past Dinner is ready in 30 minutes or less. Definitely my kind of recipe! Add a side salad, and you have everything you need for a great meal. Even Thing 2 loves this dish! 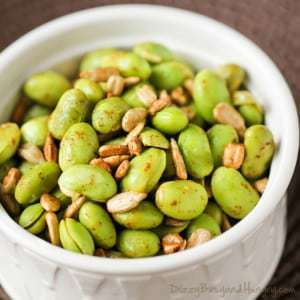 You can easily substitute a whole grain pasta if you would like to add some fiber into the nutritional profile of this recipe. In general, I prefer to use whole grain pasta, but for this dish I wanted the cute spiral pasta, and they didn’t have a whole grain version of that! The next time I make this, I will probably go with penne or a light pasta so that I can stick with the whole grain. A healthy ground turkey penne pasta bake sounds so delicious. Its going to be a hit with the whole family. You can switch out the vegetables as well. Green beans, cauliflower, snow peas, carrots, corn, even spinach – the list is endless! Experiment with different veggies and find the combination that your family loves! Also, this would work well with leftover turkey, so bookmark this recipe to come back to after your holiday meals! If you don’t have fresh basil handy, you can omit that ingredient. It won’t taste quite the same, but it will still be delicious! I just buy a whole bunch of basil from the store and use any remaining leaves to make my broccoli pesto sauce or use them as toppings on my easy pan pizza. Basil gets used up very quickly in my home. I am always looking for more healthy ground turkey recipes that I can serve my family. Last time, I served them this turkey rotini bake and it was so delicious. As long as it tastes good, my family doesn’t notice that they are eating a healthy dinner recipe! 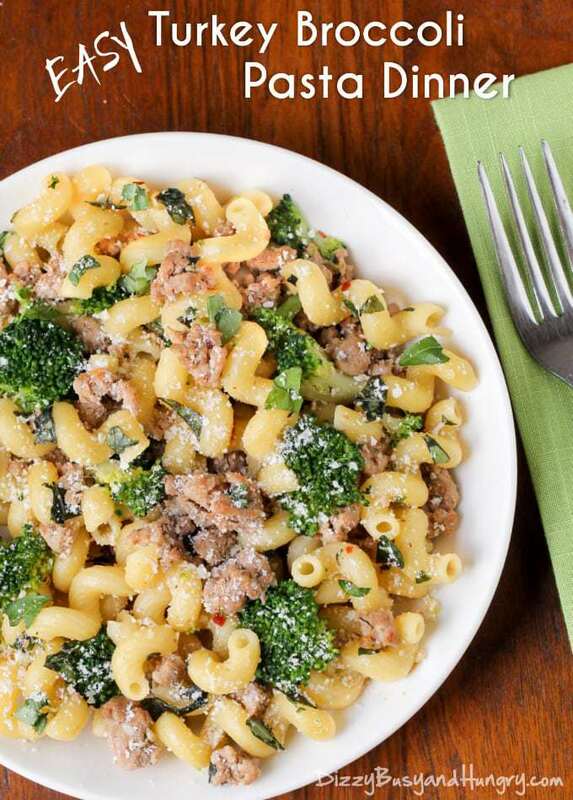 For those busy weeknights, this easy turkey broccoli pasta dinner is exactly what I like to make. Its ready in 30 minutes and I feel good serving a nutritious meal to my family. Easy pasta recipes with fresh veggies is one of my personal dinner favorites. Pasta has a wonderful way of soothing me from the inside, doesn’t it. We never have leftovers whenever we have pasta for dinner. In fact, when I make my baked ziti with mushrooms and spinach in a slow cooker, I always make extra that can be used as leftovers for lunch the next day. 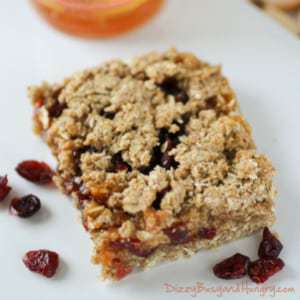 Stop by my Facebook page where I like to share some of my favorite family recipes from me and other talented bloggers. What’s your family’s go-to quick turkey recipe for dinner? Super-easy, family-pleasing dinner ready in less than 30 minutes! Cook the pasta according to the instructions on the package. During the last minute of cooking, add the broccoli. Drain the broccoli and pasta and return to the pot. Cover and set aside. Heat 1 tablespoon of olive oil over medium high heat. Add the turkey, paprika, garlic, red pepper flakes and salt. Sprinkle with Parmesan cheese when serving. This sounds fabulous! I have been looking for something to cook up with leftover turkey that I still have in our freezer from Christmas. Thanks so much for sharing with us at Encouraging Hearts and Home. Pinned. Ah yes, please! This looks great! I will have to try it. Easy and good!! Looks fabulous – Thanks for sharing at the What’s for Dinner party! Soooo, at what point do you cook the broccoli? Not sure if I missed something or not. Hello! The broccoli cooks in step 1 when you add it to the boiling pasta water. Cooking the broccoli that way gives it a nice tender-crisp texture. I hope you enjoy it! Thanks for stopping by! Can we use frozen broccoli? Or is fresh best? This is so yummy! Made it with ground chicken because that’s what I had. Also made it with these noodles I got from aldi- garden herb artisanal pasta (sounds fancy for $2!). Anyway it was amazing! I think regular pasta would be too bleh. I made this last nite minus the fresh basil b/c I forgot it but added cilantro and added cayenne pepper instead of the red pepper flakes it was awesome ! There were no leftovers! Great substitutions! I think I will try those next time I make this! 🙂 I am so glad you liked it, and thanks for stopping by! Tried this tonight. Had to cut recipe in half (for two). Hubby wasn’t crazy about it — said it was too dry. Turkey doesn’t have a lot of fat so maybe some cream of mushroom soup might make it tastier? How great that you can switch it up and add whatever veggies or pasta you may have on hand. My family loves a good pasta dish, and I love how versatile this is! This looks super tasty! I love a dinner that combines everything! I love the red pepper. What a great way to add some zip to an easy dinner.